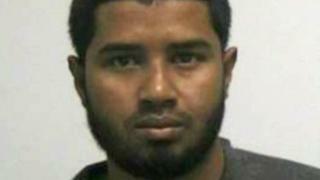 Suspected New York City bus terminal bomber Akayed Ullah has been charged with terror offences, police say. The 27-year-old Bangladeshi immigrant was wounded in the attack at the Post Authority Bus Terminal in Manhattan on Monday morning. Mr Ullah is reported to be in a serious condition in hospital after suffering burns when a crude device that was strapped to his body exploded. Three other people suffered minor wounds in the blast during rush hour. The New York Police Department (NYPD) tweeted on Tuesday that Mr Ullah had been charged with criminal possession of a weapon, supporting an act of terrorism and making a "terroristic threat".